Pros: This endearing and unusual picture of friendship will have you reminiscing about your own pals from the past. Cons: It takes some time for the story to get going and grab your attention fully. Theatre503, seated on top of Battersea’s The Latchmere Pub, presents here another piece of theatre that will most definitely get you thinking. Brought to life by Barefaced Theatre Company, Shadow Kingdoms is written by Berri George and was nominated as a runner up for the 2017 Mercury Playwriting Award. The company strives to bring new work and talent to all audiences across the UK, with the focus planted firmly on storytelling, physicality and – of most importance to me – strong female roles on and off stage. Upon viewing the stage for the first time, you will see a long piece of graffiti slashed in the middle of the scene – yellow, blue and grey dominating the art. On both sides of the stage grey screens are propped up, which to my mind stood as blank canvases waiting to be painted. The story is set in the early 2000s. You are introduced to two teenagers; a mysterious graffiti artist hiding in the shadows and a curious fan that is determined to find out who is hiding behind the paint can within some of his favourite pieces. After their unusual introduction we realise how different the two are: one has fled the ravages of a Civil War and lost more than we can imagine, and the other one is just trying to escape a troubled life. Together they form an unusual bond which allows them both to make sense of their isolated lives, all whilst spray painting London. 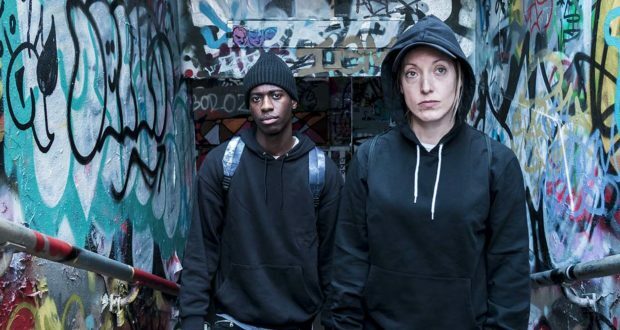 Katie Warren takes on the role of Mute – the mysterious artist who takes ‘Nxstar’, played by Jorden Myrie, under her wing and teaches him all that she knows about the art of graffiti. For him she is a hero, which it takes a while for her to grasp, as it does for her to warm up to the idea of teaming up with a kid that knows ‘nothing’. But Nxstar’s curious and quirky nature proves endearing, and Mute slowly embraces the idea of creating art together and sharing the graffiti stage. Fantastic comedic cues from Jorden Myrie were definitely my favourite part of the show. His portrayal of an underground graffiti enthusiast is genuine and honest, whereas Katie Warren – who is also a creative associate at Barefaced Theatre – brought mystery to her character, leaving you wanting more. The performance is an unusual piece of theatre, exposing you to a world which you probably know very little about – the world which leaves London colourful, despite the forces trying to oppose it. Set in the darkest hours of the night, it nevertheless is drenched in all the colours of the rainbow.